Lucky Casino will then reward you with a bonus (Welcome Bonus is for new players only). The terms and conditions of the bonuses vary between different casinos and might also change over time and between different countries, so it is important to compare the different offers and read the T&C for Lucky Casino before signing up. 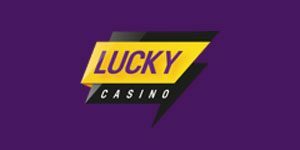 Established in 2016, Lucky Casino is a straightforward brand, determined to help you summon good fortune while you play. Its mascot is an Irish leprechaun Lucky, who is ‘working hard to let you see the rainbow and reap the treasures carried in the end of it.’ He is not the only character around; there’s also Doctor Scatty, Baroness Campaigny and General SignUp. Lucky is packed with slots, table games and jackpots, all nicely placed among the clouds, with a rainbow arching above them. Lucky Casino is operated by Viral Interactive Limited, a Maltese company which operates several other gaming venues online. It is owned by Glitnor Marketing LTD. The website has a triple license; it is regulated by the UKGC, by the Malta Gaming Authority and the Government of Curacao. Oriented towards the European market, Lucky Casino offers layouts in English, Finnish, Swedish, Norwegian, and German. Lucky invites you not to register, but to start your quest, collect loyalty coins and explore the free spins shop. 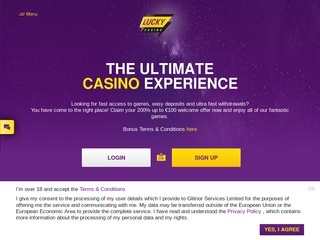 Lucky’s welcome package consists of multiple bonus offers which can amount to €1,500 in total. Should you deposit €10 to €500 you become eligible for a 100% bonus up to €500. The wagering is only 35x, deposit + bonus, on this initial offer, and if you deposit more you will enjoy lower wagering. As soon as you set foot into Lucky’s territory you get a chance to make friends and play awesome games. These games are supplied by multiple providers, all of which have a great reputation in the business. Some of the more resonant names are Microgaming, Play n’ GO, NetEnt, BetSoft, Pragmatic and Yggdrasil. The rest of the lobby is supplied by smaller studios like Nolimit City, Endorphina, Mr. Slotty and Red Rake Gaming. Lucky Casino does not go into details when it comes to sorting games into categories. There are three main categories: Jackpots, Slots and Table Games. Slots include both video slots and classic fruit machines, and Table Games also include live dealer tables, aside from regular, virtual table and card games. More than 1,100 games are hosted on the platform. It’s not for nothing that the designers chose to place the game collection of Lucky Casino among clouds – the library is a heaven for slot lovers. Popular and new titles are at the top of the list, and by scrolling down you get to reveal more and more available games. NetEnt’s licensed slots like Motorhead, Creature from the Black Lagoon and Planet of the Apes offers striking visuals and remarkable themes. For a more traditional slot experience, games like Double Wammy, Fruit Fiesta and Break Da Bank are at your disposal, not to mention an astounding collection of jackpots which contains celebrated slots like Treasure Nile, Mega Moolah and Tunzamunni. The table section is crowded with games hosted by live dealers. If you want a standard table layout in a simulated environment, you can go for Baccarat, Pontoon, European/French/American Roulette, Multihand Blackjack or Caribbean Poker. There’s also Casino Hold’em and several blackjack variants. Classic virtual tables are mostly provided by Pragmatic, BetSoft and Play n’ Go. Alternative types of games are all mixed up with table games, so that’s where you need to look if you want to enjoy a game of Yatzy, Jacks or Better video poker, Super Wheel, Keno, Beat Me, Freecell or Solitaire. These are some interesting offerings, and players will be glad to know that every game at Lucky Casino has its payout percentage published and can be played in demo mode and for real money. Table games operated by live dealers are located in the Table Games section. The entire suite originates from the creative kitchen of Evolution Gaming, the world’s leading live casino supplier. Lucky Casino customers can immerse themselves in authentic games of Casino Hold’em, Blackjack (Grand, Silver, White, VIP), Roulette (Mini, Immersive, French Roulette Gold), Speed Baccarat and more. How would you handle deposits at Lucky Casino? Quite easily, once you pick one reliable and efficient payment methods from the list of supported option. This list includes: Visa, MasterCard, Neteller, PaysafeCard, Trustly and Skrill. Card and e-wallet deposits carry a fixed fee of £/€/$2.5 and require a minimum deposit of €/$ 10. The withdrawal limit per month is 25.000 Euros (the limit does not apply to progressive jackpot wins). Lucky Casino’s customer service team is available 24/7 via live chat or email. Chat support is agile and responds instantly, whereas email support responds as quickly as possible, and not later than within two business days. Overall, that’s all good news, and the only inconvenience is that there is no phone support available. There is no FAQ page either, but the Terms and Conditions section is quite elaborate. If you find yourself in a pickle while at Lucky Casino, at least you’ll be lucky enough to have a friendly support agent solve your problem.